On this day a year ago, thousands of home care workers first joined striking fast food workers in the #FightFor15 by marching with them in the streets. Since joining we’ve won $15 for home care providers in Massachusetts and Oregon and paid sick days for workers in Minnesota. That’s home care workers across the country are taking part in an exciting campaign to bring attention to the need for fair pay in our industry. 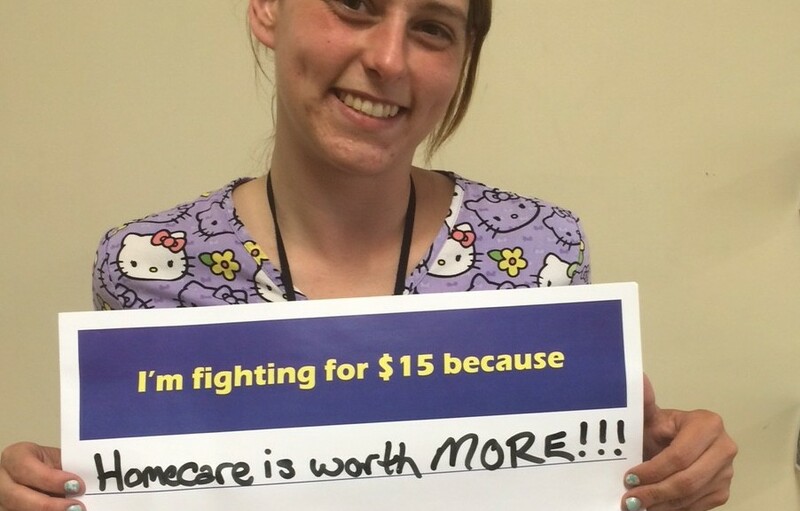 It’s called #Take15for15 and it gets the faces of voices home care workers front and center in the ongoing movement for a living wage and respect on the job. The video below explains how. By posting our #Take15For15 pictures on Twitter, Facebook, Instagram – everywhere – we let our elected officials and the press know that our movement won’t stop until we win $15. Are you a home care worker or supporter? Sign the petition for $15.